Eggs: need to be room temp. This takes a number of hours from a fridge, but once they are out you can actually just leave them sitting out for days and days and days (and weeks, and possibly months). You also don't necessarily need to empty the eggs, though you can (I empty mine AFTER I varnish them). Designing: you can write in pencil on the eggs, but be sure NOT TO ERASE. it will be bad. You can erase (gently!) 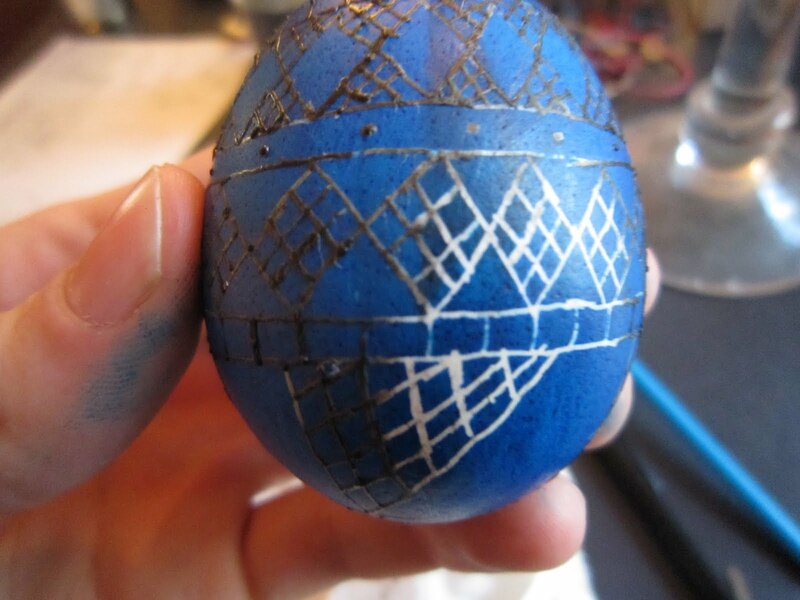 any lines that are left AFTER the egg is finished (before varnishing) with a normal eraser, but most lines are picked up by the wax and disappear. Waxing: To get wax into a kistka, heat the kistka over the candle, then scoop up the fancy wax. always do this facing AWAY from you, as periodically you will get balls of melted wax flying out into space. 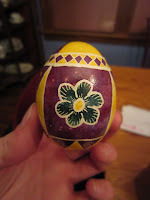 Heat the kistka over the flame; the soot from the flame will darken the wax so you can see it on the egg! Always draw a line on a piece of newspaper before touching the kistka to the egg or you risk spilling lots of wax on the egg all at once (disaster! since any wax that ever touches the egg forever makes that part of the egg the color it presently is). Lines work best if you make them quickly and all at once; ideally look at where you want the kistka to go while drawing the line to make it straight as possible. Remember you'll be drawing backwards: first you wax a white egg so anything you wax at first will be white in the end, then you dye it (color) and after that anything you wax will be THAT color, etc. Start with light colors then work your way darker. Dyeing: Wait until the dye cools to dip the eggs! I recommend using a spoon to set the eggs down into the dye when you are dyeing the eggs so you don't drop and crack them. Dye for 1-3 minutes; the longer you go the darker it gets. 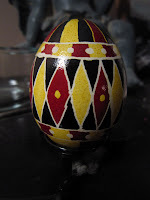 Try to hold the dye in a container where it will be deep enough to cover the whole egg but not so deep that you risk dropping the egg and cracking it. To get eggs out of dye i recommend picking them up in the spoon, then picking them out of the spoon in a paper towel. Blot dry, do NOT rub dry! this can smear color and wax and lead to awful things in the future. 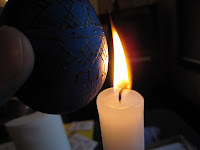 Removing Wax: place the egg next to a candle flame, and let the wax melt a bit, then rub off with a paper towel. Don't cook the egg! also don't put the egg over or in the fire because the black soot will get all over it. 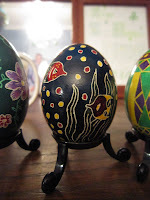 Varnishing: i coat my eggs in polyurethane. 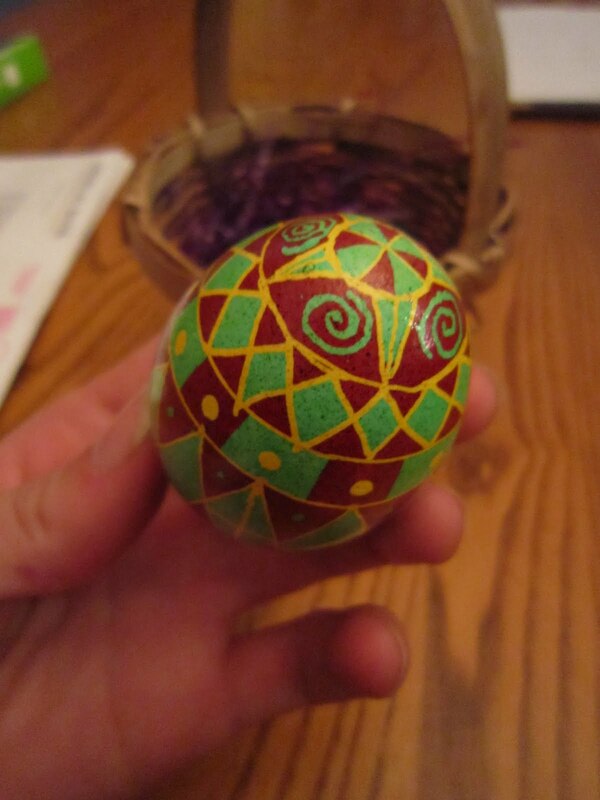 I actually just dip one finger in the polyurethane and rub it onto the egg. You can also use some sort of gloves, but i forget what kind. Don't use a paper towel or anything like that because they will fall apart into the varnish and be gross. 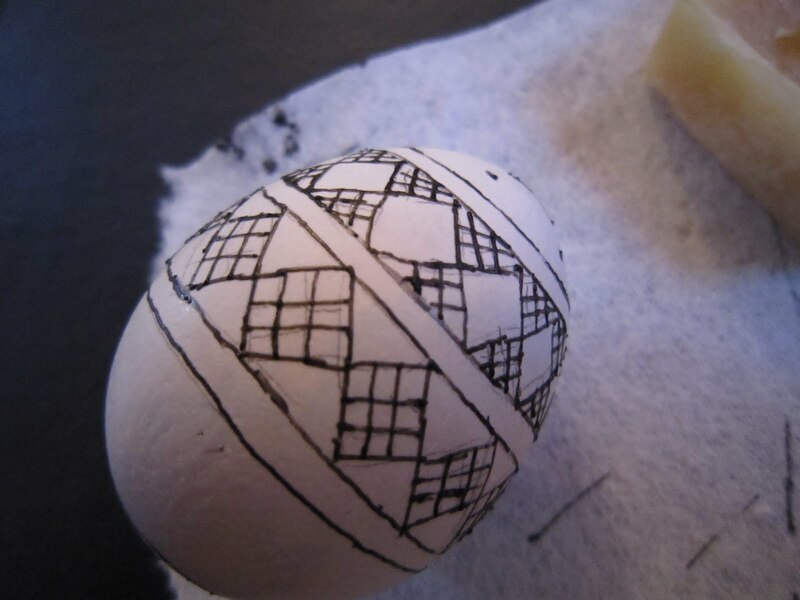 To dry the eggs once varnished, you can make a tiny stand with four (or three) small nails or pins sticking up through a piece of cardboard (set the egg on the nails, not the cardboard). 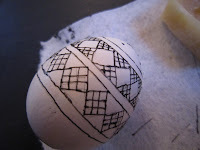 after a bit, rotate the egg so that the nails don't leave points in the varnish when it hardens. Other Notes: you can 'spot' paint an area by dipping a q-tip in dye and dabbing it onto a spot and letting it sit for a bit. This way you can do more colors without dyeing the whole egg and making everything darker. 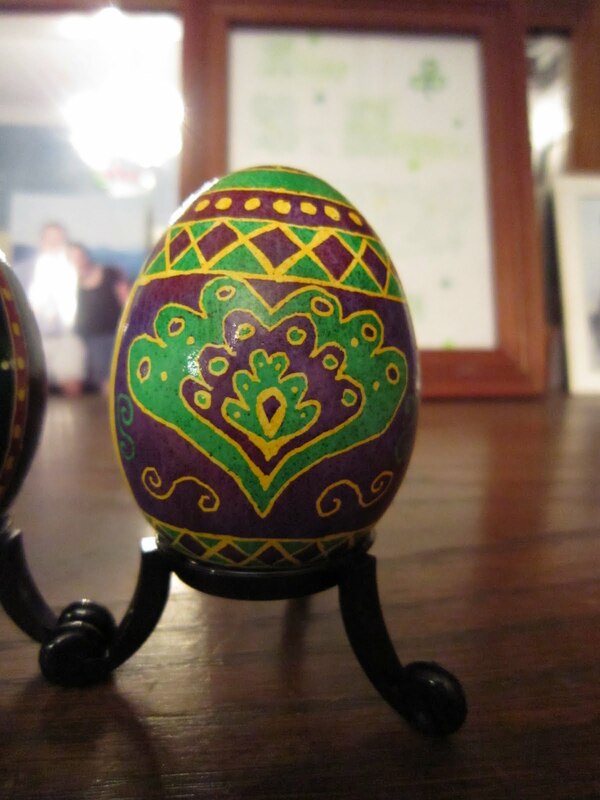 Remember to put a layer of wax over the places you spot paint before dyeing the egg the next color! 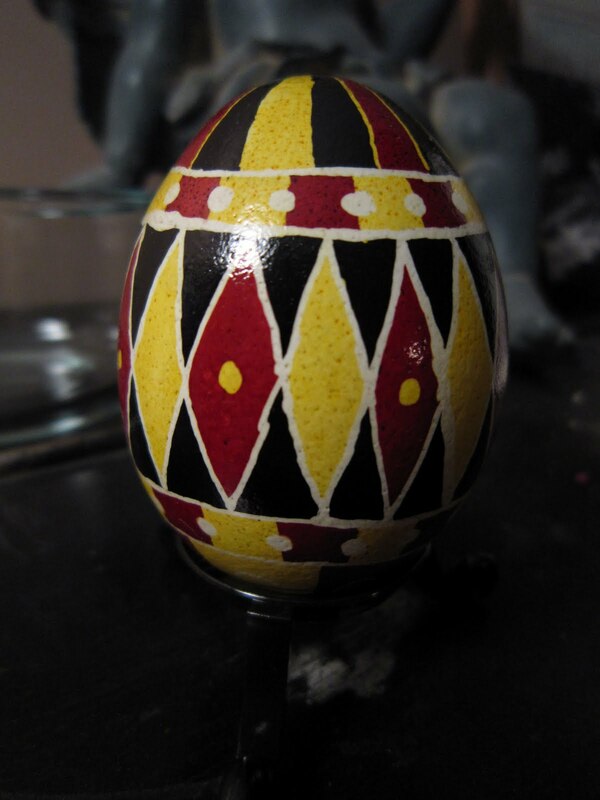 This is an undyed egg after the first wax layer. Notice that the beeswax, which started clear, turned black when held over the candle. After the last dyeing, you remove the wax. Put the egg near the flame, let the wax melt, then rub it away with a paper towel. If you empty the egg before you dye it, this goes super fast because the entire egg can heat super quickly when it's just the hollow shell. 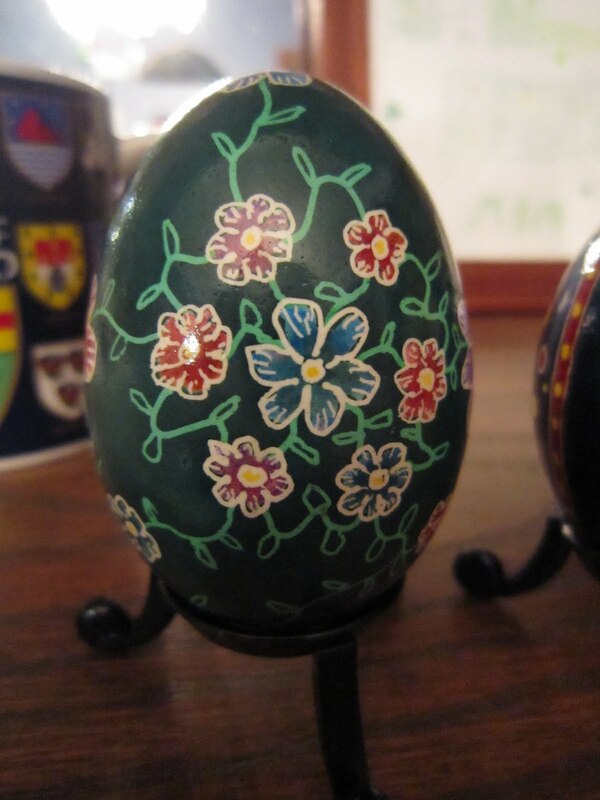 A non-empty egg will take a bit longer to take the wax off. Here you can see some wax on, some wax off.